CitriSurf® 77 is a citric acid based formula that safely and effectively removes limescale deposits caused by hard water as well as combustion chamber scale in heat exchangers and boilers. It is an easy to use spray on and rinse off product that comes with specific instructions for limescale removal and boiler/heat exchanger cleaning. Be sure to follow all manufacturer's instructions. Do not apply CitriSurf to electrical wiring or other conductive material that is connected to electrical current without first turning off all electricity. CitriSurf is a water based conductive material and serious injury or death can result from electrical shock. Clean the combustion chamber and heat exchanger surface with a soft brush and/or rinse if necessary. 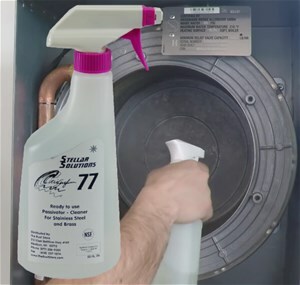 Spray CitriSurf 77 on the surface of the heat exchanger and allow it to soak for 12-25 minutes. Respray as needed to keep the surface wet, removing any debris with a soft brush. After soaking, rinse the surface thoroughly with clean water and allow to completely air dry. Drying can be accelerated by use of a hot air blower like a hair dryer, or with a clean cloth. Repeat process if necessary to obtain desired results. Viessmann has approved CitriSurf 77 as an alternative product to CitriSurf 3050, which is specified in their manuals. Spray CitriSurf 77 on the item to be cleaned and allow it to soak for at least 5 minutes. Respray as necessary to keep the surface wet. After soaking, rinse thoroughly with clean water and allow to air dry. Drying can be accelerated by use of a hot air blower like a hair dryer, or with a clean cloth. Repeat process if necessary to obtain desired results. Q. Is this the same product as the CitriSurf 77 used to clean and passivate stainless steel? A. Yes. This is the same product. In addition to passivating stainless steel, it is effective at removing limescale and cleaning heat exchangers. When purchased in the Boiler/Heat Exchanger and Limescale Cleaning package, specific instruction for scale removal and boiler cleaning are included. Q. Are there other uses for CitriSurf 77? A. Yes. It is also an effective Cleaner for Brass and Bronze.